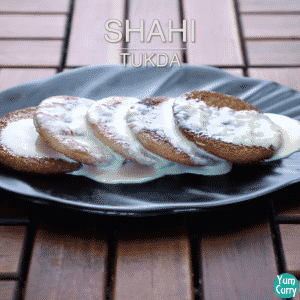 Shahi tukda is a bread based dessert. It is a rich bread pudding with dry fruits, flavoured with cardamom and saffron. 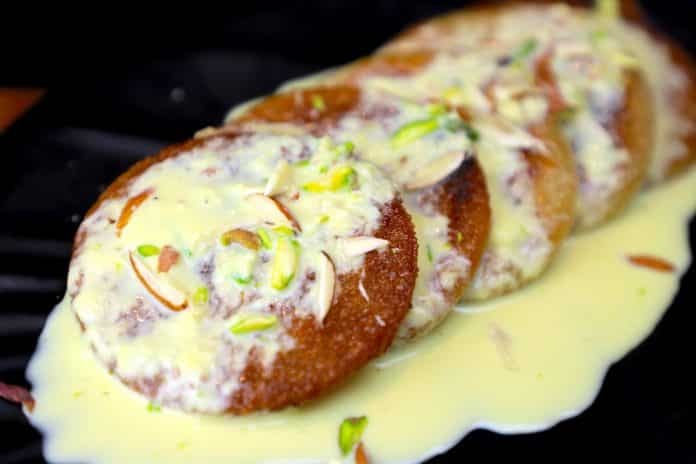 This rich, sweet and delicious dish is prepared with fried breads in Ghee/clarified butter, glazed in sugar syrup and later topped with creamy rich flavour full rabri (thickened sweetened milk) and garnish with chopped dry fruits. Shahi tukda is mughalai dessert and originated during mughal reign. Most of the royal dishes filled with dry fruits and ground spices. Shahi tukda is also royal sweet dish. Shahi means royal and tukda refer to piece, so its a royal piece. This sweet dish is Juicy, crispy, creamy and flavourful. Shahi tukda is Popular hydrabadi dish it is same as double ka meethe. Shahi tukda is popular and specially prepared during the holy month of ramdan. Traditionally shahi tukda is prepared with fry bread in clarified butter and dunked in to the sugar syrup and topped with rabri( thickened sweetened milk). It is very rich in taste, aroma and calories. The best part is you can make them in advance. It is also best for preparing special festivals like diwali. When there are lots of guest visiting you for sharing love and blessing and you have to keep ready with lots of sweet and savoury dishes. so Lets include this royal and delicious dish to your diwali menu and make your guest feel special. Shahi tukda is very simple yet delicious dish. 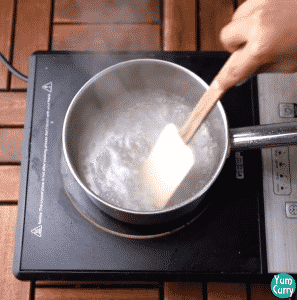 To make shahi tukada there are 4 major steps. first we prepare rabri then sugar syrup after that fry bread and finally dunk them in to the sugar syrup, while serve pour some rabri (thickened sweetened milk)over fried and sugar syrup glazed bread. For preparing rabri boil milk and stir occasionally. 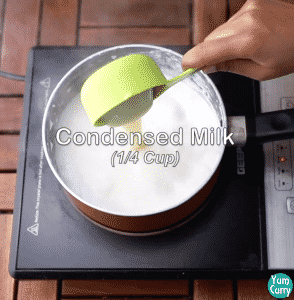 When milk reduced to half, add condensed milk. 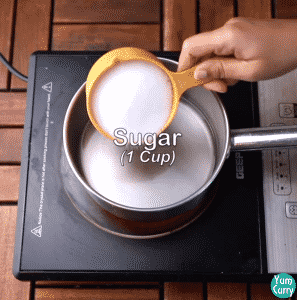 Instead of condensed milk you can also add sugar. Flavour rabri with Saffron infused milk and cardamom powder. When milk gets thickened. Switch off the heat and keep it aside. 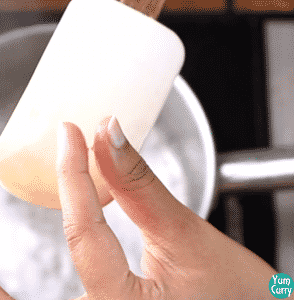 Prepare one string consistency sugar syrup by adding water and sugar in the same proportions. Stir until sugar dissolve completely, when you get one string consistency sugar syrup switch of the heat and keep it aside. 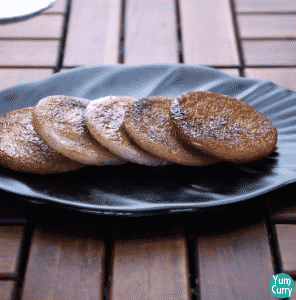 The next step is to fry breads. I am shallow frying it, you can deep fry for more crispness. 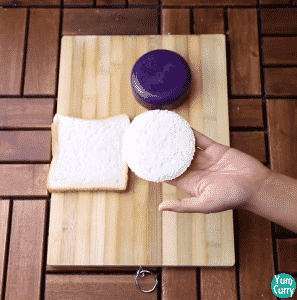 Take a bread piece cut it to the round shape. 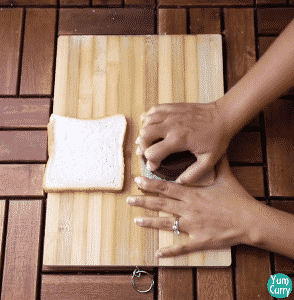 You can utilise rest portion of the bread for making bread crumbs. You can also cut them diagonally. 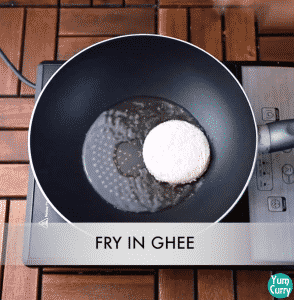 Add clarified butter/ghee in to the pan and fry them until turn crispy and golden brown from the both side. Take out the breads from ghee, dunked them into the hot sugar syrup and leave 10 for minutes, so they can soak syrup nicely. Serve hot and pour some rabri on to the bread pieces. Garnish with pistachio and almonds. Shahi tukada taste best when it is serve cold, for chilled shahi tukada make rabri a before day and keep it to the refrigerator and pour chilled rabri on shahi tukda while serve. 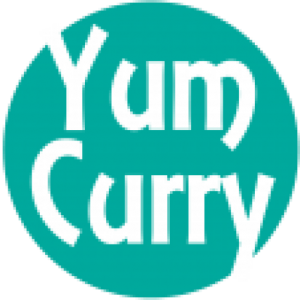 I have prepared more sweet and savoury dishes with bread like bread gulab jamun, bread upma, bread roll, bread samosa, bread pakora, rava bread click on the name to get full recipe. I have used white bread. You can replace it from whole wheat bread. 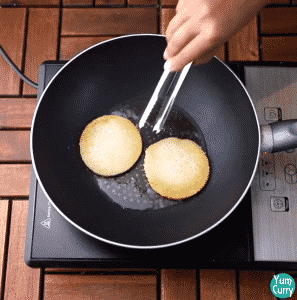 Instead of shallow frying you can deep fry breads for more crisp. I made round shape just for presentation, you can make triangular shape. It can enjoy cold and hot. If you want to serve chill, prepared rabri a day before and keep it to the refrigerator and serve shahi tukda with chilled rabri. 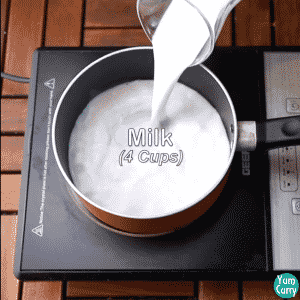 Heat a deep pan, add 4 cups of milk. 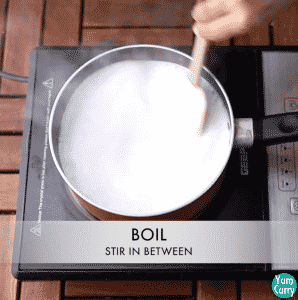 Stir occasionally, bring to boil. 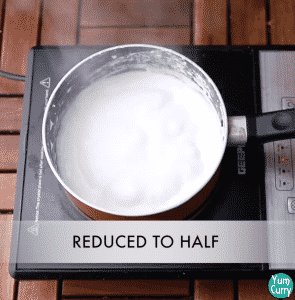 Boil and continuously stir until it reduce to half or thickened. 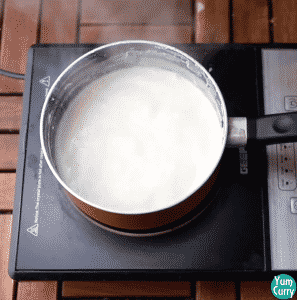 Add condensed milk. Mix well. 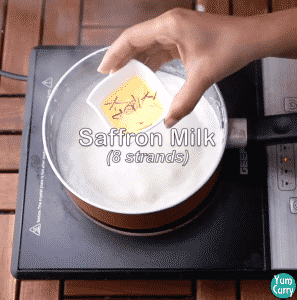 Add saffron infused milk( soak 8-10 strands of saffron in to 1 tbsp of milk for 10-15 minutes). For flavour add 1/4 tsp cardamom powder. We need 1 string consistency sugar syrup for shahi tukda. If thin and long string formed, when tested in between fore finger and thumb, sugar syrup is ready. When you get one string consistency sugar syrup immediately switch of the heat. Keep it aside. Take a piece of white bread. Cut it to the round shape by using cookie cutter or any sharp edge bowl, you can also use round shape lid of any container. 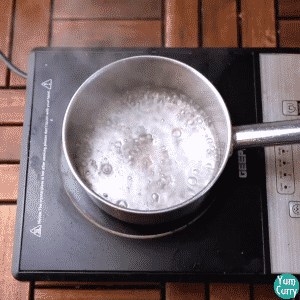 Heat a pan. Add some ghee/clarified butter to the pan. Now start adding bread pieces. 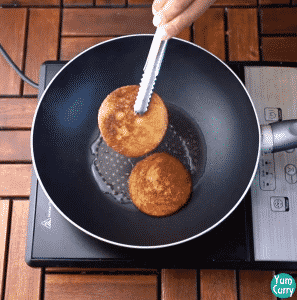 Flip them occasionally until they turn golden brown from the both sides. Take bread pieces out from the pan. 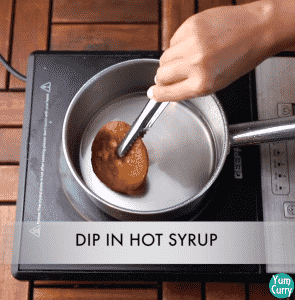 Dip breads into the hot sugar syrup. 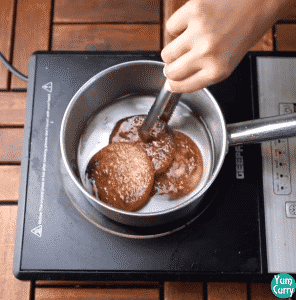 Coat them well by flipping 2-3 times and soak into the sugar syrup for 10 minutes. When breads soaked sugar syrup nicely, take them out from syrup. Take a serving plate. 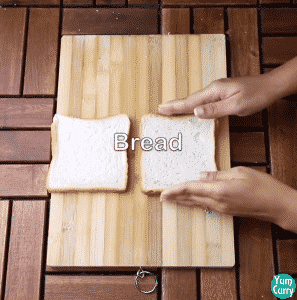 Add pieces of bread. Pour thickened milk or rabri on to the bread pieces. Garnish it with some chopped pistachios and almonds. Shahi tukara is ready to enjoy. We need 1 string sugar syrup for shahi tukda. If thin and long string formed when tested in between fore finger and thumb, sugar syrup is ready. Heat a pan, pour some ghee/clarified butter to the pan. Now start adding bread pieces. 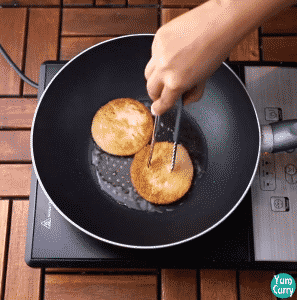 When bread fried well, take it out from the pan. Dip breads into the hot sugar syrup, Coat them well by flipping 2-3 times and soak them into the sugar syrup for 10 minutes.